There is nothing both so soothing and so promising in the early morning light than melting a pat of butter in a hot skillet. Well, except for listening to my espresso machine sputter out its dark liquid treasure while being enveloped by its hypnotic aroma – but that’s not happening anytime soon lest I inadvertently pass some caffeine to Little C, which I will ultimately end up paying for come bedtime! So for now…butter. Golden and sunny and smelling of only good things. A little yellow island in your pan slipping and sliding and melting into the beginnings of deliciousness. If you were industrious and made some pancake batter the night before, you can lay ladlefuls of it in the pan, letting them cook in the hot butter. If you were up for most of the night feeding your little one while sneaking in some dvd watching (on the laptop with headphones!) with your other half, then maybe you can manage some French toast, likewise slipping them in to cook in the butter. Or, if you’ve snuck out of the room while everyone else was still asleep, and there hangs a lovely silence in the air (even in the middle of a busy city), perhaps you’d like to stir a pot of this while you count those blessings that seem to leap fresh in your mind in that early morning air. – Heat the milk and water in a saucepan. When hot and small bubbles begin to form on the sides of the pan, stir in your oats. Let this cook over low heat for about 10-15 minutes then add the raisins and the maple syrup. Cook further, about 10-15 minutes more, stirring regularly, until oats are done to your liking. If it starts to dry out before the oats are done add a splash more milk. – In a hot skillet melt the butter. When the butter starts to bubble, add the apple and sprinkle over the sugar. Stir gently until all the apple pieces are coated evenly. Add a couple of dashes of cinnamon (I give it two shakes) and stir again to make sure everything is distributed evenly. Swish the pan around – this helps! Cook for about 5-10 minutes or until the apples are starting to soften but still have a crunch and the butter/sugar mixture is bubbly and coating the apples. – Divide the oats into two bowls. 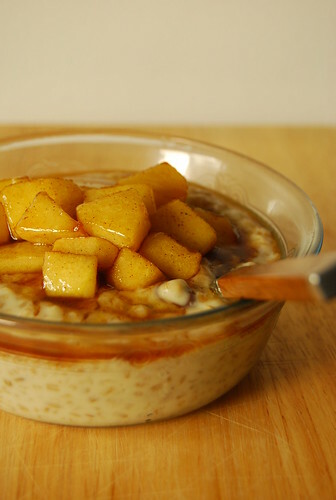 Top with some of the apple – don’t forget to drizzle some of the caramel-y sauce onto your oats as well! You may have some apple left (or maybe not). If so, save them to top your mid-afternoon yogurt. This is absolutely pure comfort in a bowl. It's nice to have steel cut oats in the cupboard when hunger strikes. seem this little ma'ma still can't wean coffee 😛 J, cinnamon, apple and oat are my top favorite, this breakfast is absolutely fabulous! My favorite oatmeal combo! Really delicious! A beautiful breakfast Joey. I have oats every morning but have never added apples this way. Hi Divina! It sure is…any type of oatmeal is a comfort food for me! Hi Barbara! Thank you 🙂 It’s lovely with the apples! it's 540 am, and the alarm buzzes, i struggle to crawl out of bed… i have to brew some coffee i thought, then the sight of this laptop on the breakfast table lured me and i gave in. checked my email and lo and behold, i saw that you stopped by my virtual kitchen. it woke me up… then i lurked into your kitchen, i saw this bowl of oats with cinnamon apples jumping off my screen…hmmmm this is just waht i needed! thanks for the post and THANK YOU for stopping by! I was thrilled to see you stop by! What lovely, comforting looking recipe! Espcially since I just purchased my first bag of steel-cut oats. I found them in the organic foods section at my grocery store, and used them for Irish Soda Bread, which was the first recip on my Irish cooking blog. My family enjoys oatmeal, so I'll have to try this recipe to make use of the rest of the oats! Uh, yes please. I was so mesmerized by the thought of this dish that I almost didn't comprehend the introductory paragraphs, lol 🙂 It's weird cos there was a time I was so sick of oatmeal, I'd drown it in condensed milk! Reviewing as many food blogs as I can looking for good recipes for desserts for a chef test I have on Friday. I love the simplicity of this one. Hi Malou! Nice to know this post made you smile early this morning 🙂 It was good to visit your kitchen as well! Hi Manggy! Haha! I still have condensed milk with it sometimes 😉 Not because I get sick of it but just because I love condensed milk! Yummy! That looks too delicious. I write a blog about food too. Come check it out if you like. Now that looks like a great way to start the day! making pancake batter the night before? genius! And your homemade oatmeal with apples beats the pants off the instant quaker stuff i'm used to, i'm sure. These look absolutely amazing.oats are totally my weakness and going to try something new with apples with tips from your recipe. Mmm… I love the crunchy heartiness of steal cut oats. And those cinnamon apples are pure comfort food. Great recipe, Joey! Yum. I really need to start eating breakfast! Hmm, I can almost smell the delicious smells that must be coming out of your kitchen..! I never take the time during the week to make something special for breakfast but I really should be doing that more often! Omgosh, I love this for breakfast. That looks so delicious, thank you for sharing! I'm so glad I've found your blog, I look forward to keeping up with it. Hi Susan! That’s one of the reasons I love steel cut as well 🙂 Thank you! Glad you like it Zoe! Hi Pippa! Thanks for stopping by and leaving a cooment! The smell of melting butter…. and cinnamon…. and apples…. The only thing better is the evening smell of melting butter and onions. Okay, maybe equal, not better. Beautiful descriptions! Returning your visit! This looks LOVELY! Hi Katiez! Oh yes! So true…love that smell as well 🙂 Then there is the bread baking smell…mmm! that's a lovely photo. girls who love their butter are muy hot. i like seeing the buttery apple caramel layer seeping into the oats. it makes me feel warm and fuzzy inside. i used to feel a Calvin-esque hate towards oats until i took it upon myself to grab a pot, use more liquid, take more time (and sugar milk butter and cinnamon..plus a wayward banana or apple). The first bite of lovingly cooked oats pretty much did away with years of cold, thick sleepy moutfuls of instant mush. Now THAT'S how a breakfast should look. I can smell those cinnamonny apples from here! Hi Jeanne! I surely think so 🙂 Love waking up to a bowl of this! This is the most wonderful steel cut oat recipe I've found. I make it every Sunday morning. Thanks for the recipe! I love this meal! I make it often and only wish I had found it sooner!